The Berlo’s model of communication takes into account the emotional aspect of the message. 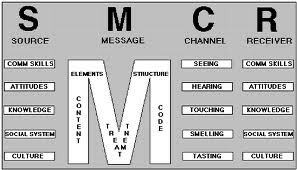 Berlo’s model of communication operates on the SMCR model. The source in other words also called the sender is the one from whom the thought originates. He is the one who transfers the information to the receiver after carefully putting his thoughts into words. Communication SkillsAn individual must possess excellent communication skills to make his communication effective and create an impact among the listeners. The speaker must know where to take pauses, where to repeat the sentences, how to speak a particular sentence, how to pronounce a word and so on. The speaker must not go on and on. He should also make a point to cross check with the recipients and listen to their queries as well. An individual must take care of his accent while communicating. AttitudeIt is rightly said that if one has the right attitude, the whole world is at his feet. There is actually no stopping for the person if he has the right attitude. A person might be a very good speaker but if he doesn’t have the right attitude, he would never emerge as a winner. The sender must have the right attitude to create a long lasting impression on the listeners. KnowledgeHere knowledge is not related to the educational qualification of the speaker or the number of degrees he has in his portfolio. Knowledge is actually the clarity of the information which the speaker wants to convey to the second party. One must be thorough in what he is speaking with complete in-depth knowledge of the subject. Remember questions can pop up anytime and you have to be ready with your answers. You need to be totally familiar with what you are speaking. Social SystemImagine a politician delivering a speech where he proposes to construct a temple in a Muslim dominated area. What would be the reaction of the listeners ? They would obviously be not interested. Was there any problem in the communication skills of the leader or he didn’t have the right attitude ? The displeasure of the listeners was simply because the speaker ignored the social set up of the place where he was communicating. He forgot the sentiments, cultural beliefs, religious feelings of the second party. CultureCulture refers to the cultural background of the community or the listeners where the speaker is communicating or delivering his speech. When an individual converts his thoughts into words, a message is created. The process is also called as Encoding. ContentOne cannot show his grey matter to others to let him know what he is thinking. A thought has to be put into words and content has to be prepared. Content is actually the matter or the script of the conversation. It is in simpler words, the backbone of any communication. Ted to Jenny -“I am really exhausted today, let’s plan for the movie tomorrow evening”. Whatever Ted has communicated with Jenny is actually the content of the message. It is very important for the speaker to carefully choose the words and take good care of the content of the speech. ElementIt has been observed that speech alone cannot bring a difference in the communication. Keep on constantly speaking and the listeners will definitely lose interest after some time. The speech must be coupled with lots of hand movements, gestures, postures, facial expressions, body movements to capture the attention of the listeners and make the speech impressive. TreatmentTreatment is actually the way one treats his message and is conveys to the listeners. One must understand the importance of the message and must know how to handle it. If a boss wants to fire any of his employees, he has to be authoritative and can’t express his message in a casual way. This is referred to as the treatment of the message. StructureA message cannot be expressed in one go. It has to be properly structured in order to convey the message in the most desired form. CodeEnter a wrong code and the locks will never open. Enter a wrong password, you will not be able to open your email account. In the same way the code has to be correct in the communication. Your body movements, your language, your expressions, your gestures are actually the codes of the message and have to be accurate otherwise the message gets distorted and the recipient will never be able to decode the correct information. 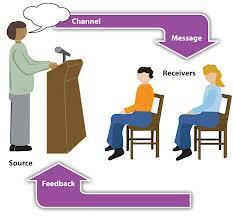 Channel – Channel actually refers to the medium how the information flows from the sender to the receiver. How does one know what the other person is speaking ? – Through Hearing. How does one know whether the pasta he has ordered is made in white sauce or not ? – Through Tasting. How will you find out whether the milk is hot or not ? – Through Touching. All the five senses are the channels which help human beings to communicate with each other. When the message reaches the receiver, he tries to understand what the listener actually wants to convey and then responds accordingly. This is also called as decoding. The receiver should be on the same platform as the speaker for smooth flow of information and better understanding of the message. He should possess good communication skills to understand what the speaker is trying to convey. He should have the right attitude to understand the message in a positive way.